Noun & adjective. Late 18th century. 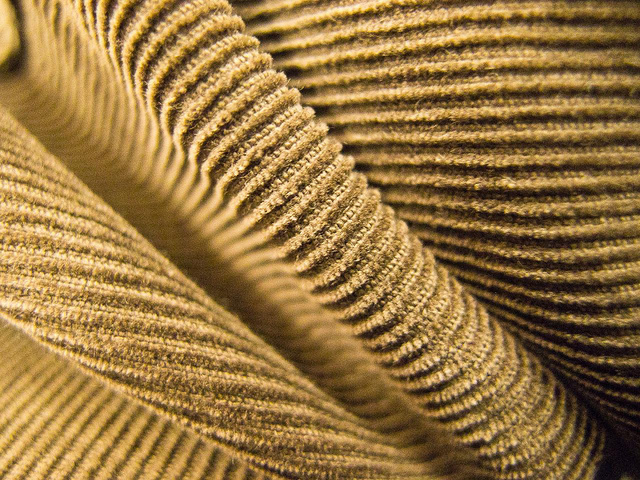 It's commonly said that the word corduroy comes from the French corde du roi, literally meaning 'the cloth of kings'. As kingly as corduroy is, this isn't true; it simply comes from cord and duroy, which is a coarse woollen cloth used in menswear in the 18th century. Still, should I by some fluke of lineage ever be crowned king, I will personally make it my business to make sure that corduroy does officially become The Cloth of Kings. I'll do some other stuff, too, of course, but that's gonna be right up there. And in my adulation of corduroy, I'm in good company. The 11th November, for example, is Corduroy Appreciation Day, that date so chosen because written 11/11 it rather resembles corduroy itself. They even have parties in which attendees (who must be wearing at least two corduroy items) discuss wale width and their shared mistrust of velvet. Does that not just sound wonderful? I bet they're the types that read dictionaries too. I love them. Do please cordon off your most royal comments in the box below. Witty and lovable is the sense of humor in your writing style Ed. Hmmm...the Eleventh of November...witty, yes, but not the best date in the year for looking as if you should be carrying a shotgun. Or, indeed, for celebrating anything. I can't claim much authority here as my burgundy flares have long since disintegrated, but perhaps the Eleventh of January might prove to be more convivial a date. I hadn't really thought about the date, Sally. I was too blinded by the undulating waves of mesmerising corduroy! I *really* want to get to one of those parties. There'll be a Lexicolatry t-shirt to anyone that can get me a ticket!